Chris Thurston has been early education coordinator in Weston for 23 years and the director of the Weston, MA pre-school program, Weston Windows, for the last 11. She has also been the inspiration behind the construction of Kasiisi Nursery School, this year designated a sister school for Weston Windows. 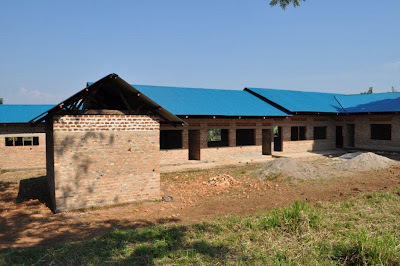 So it is appropriate that the parents and staff of Weston Public Schools celebrated Chris’s retirement in June and marked their enormous appreciation of her contribution to the education of their children with a party and fundraiser that literally put a roof on the pre-school in Uganda. Chris’s visited Uganda for a second time this summer to see the fruit of her labors in person and to continue to team-teach Kindergarten classes with Ugandan colleagues. As the mother of 2 special needs daughters, she is particularly interested in helping develop desperately needed special education resources for children in Kasiisi Project schools. In her honor, one room of the new nursery school will be designated as a resource room for children with learning difficulties. A search for a special education teacher will be launched in the fall. This entry was posted in Nursery School. Bookmark the permalink. Awesome, glad to see it completed! I liked the way you put together everything, there is certainly no need to go any further to look for any additional information. You mentioned each and everything that too with much of ease.